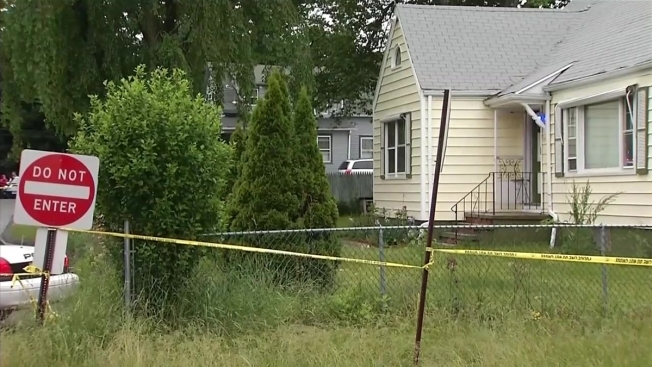 Three days after two young children were found dead in an East Haven home, the community is still trying to come to grips with the tragedy. Friday night, dozens of friends and family members of Aleisha Moore, 6, and Daaron Moore, 8, brought candles and gathered to remember the two young lives lost too soon. Clutching to his loved ones, surrounded by strangers, and lit only by candlelight, Michael Moore, the father of the two kids found dead in their East Haven home this week was among those attending the candlelight vigil. “It’s a great blessing. It’s actually restored my faith in humanity that people are willing… willing to help when the next man is down," he said. Originally, a planned candlelight vigil was to be held outside the home where the children’s bodies were discovered. Instead, in anticipation of a larger crowd, that vigil was held at the East Haven Green. Not far from the green, on Strong Street, a memorial of teddy bears, notes and candles continued to grow at the front gate of the home where Aleisha and Daaron lived with their mother, LeRoya Moore, 36. Michael Moore, her ex-husband, spoke with NBC Connecticut earlier this week and said he is devastated by the loss of his two children. He said he is also waiting for new information from police about what may have happened leading up to the kids' deaths. Friday night, those who knew the children – and even those who did not – came together to honor the young lives lost. “There are children involved and I think that is what our main focus is,” said Lisa Criscuolo, who lives just a few houses away from the Moore’s home. “There were two lives taken here that were super young and they had a full life to live. We want to come together as a community and a town to show our support." The children’s mother is still hospitalized with injuries to her arms and wrists. When police arrived at the home on Tuesday, they say the house was filled with natural gas and the bodies of the two children were inside. Police said in a press conference earlier in the week that it appeared the gas had been turned on, but that it was unclear. A friend who called 911 that day from outside the house said that she had received a letter from the mother saying she planned on committing suicide and that she told her over the phone she cut herself, according to the recorded calls. The vigil at the East Haven Green begins at 8:15 p.m. Friday. Participants are asked to bring their own candles to light in remembrance of the two young children.